Where are we now? CLICK TO FIND OUT! Images and video from San Luis Obispo County, California! Interested in the van dwelling world? Come along with us for a tour of our van! We love capturing beauty in all forms. Browse our photos and purchase prints if you'd like. Josh skiing off of a 50 foot cliff at Solitude Mountain Resort in Utah. It's not always easy traveling 24/7. Check out the gear that gets us there. 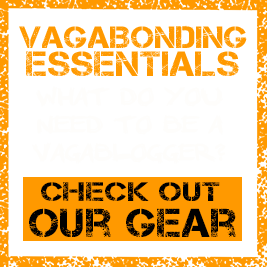 As we've traveled through life's journey, both before and after we became Vagabloggers, we've been called many things. We've been placed into many social genres and have been identified as being part of many particular cliques. Some of the labels placed on us have been: Rock Climbers, Hippies, Vegetarians, Van Dwellers, Couch Surfers, Coffee Geeks, Drifters and just plain Weirdos. Funny thing is, almost all of these labels have been applied by those outside of these social circles. If you asked the people inside these circles, invariably most of them would reply "They're cool, but they're not one of us." We've escaped the shackles of the corporate world to pursue a life of full-time adventure, travel and volunteering. This is our story.